Last week I had the pleasure of joining my husband on a convention in Las Vegas at the Palazzo/Venetian Hotel. 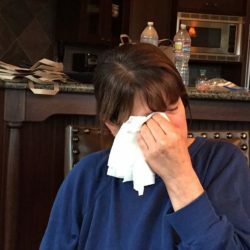 Although we didn’t take in any shows we were able to spend quality time together, enjoy the facilities at The Canyon Ranch Spa in the hotel, and savor the food. With so many chores and obligations at home sometimes you just need a break and time to regroup, have an uninterrupted conversation, and look into each others eyes. Do you know what I mean? After almost 30 years I love him even more than the day we were married, and relish the moments when we escape together. It was wonderful! Of the places we dined during our stay in Vegas we had dinner at Nobu – Nobuyuki Matsuhisa’s restaurant. The “Nobu-style” cuisine is based on Japanese cooking – fundamentally sushi – but with North and South American influences. He prides himself on using the freshest and highest quality seafood and ingredients in all his dishes. He brings out the best in the freshest seafood, and draws out the natural sweetness and textures of vegetables. He believes fish should always be fresh enough to eat raw. Shellfish, crustaceans and octopus should always, ideally, be bought when still alive. Visit Nobu and you’ll see for yourself. A suberb dining experience! When we arrived at Nobu our waiter explained the menu, and offered recommendations. We decided to let our waiter select our menu based upon our preferences. Of course I’d left my iPhone and camera in our hotel room, so didn’t take any photos, but from our appetizer to 3 desserts, all were sensational. Our two favorites were the Spicy Miso Lotus Chips with Big Eye Tuna (appetizer) and the hot Black Cod with Miso. I asked the waiter if he’d share the recipe for the Black Cod and he told me the 4 ingredients used. 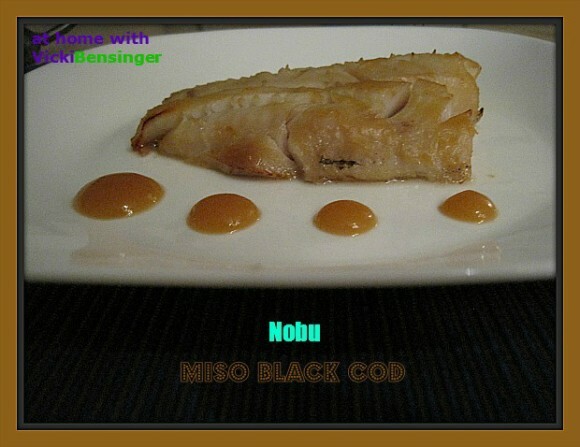 When we got home I did a bit of research, found the recipe online, and that Nobu had several cookbooks – one had the recipe for Black Cod with Miso – I purchased it. This recipe suggests using either Black Cod, Sea Bass,Salmon or beef, I opted for the Black Cod to try and duplicate what we had in Vegas. Of course the Black Cod I purchased at the seafood market wasn’t as thick as what we had at Nobu, but it was delicious. However, next time I’ll try it with Sea Bass, a favorite of mine. This recipe is surprisingly simple to prepare. 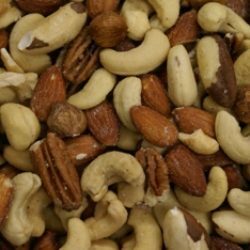 It’s slightly sweet and salty taste, keeps you going back for more. If you’re a lover of fish I hope you’ll try the recipe. Nobu has locations all over the world. We had an outstanding dining experience and although our bill came to $350 for the two of us, we both agreed it was well worth it! Bring the sake' and mirin to a boil in a medium saucepan over high heat. Boil for 20 seconds to evaporate the alcohol. Pat the fillets thoroughly dry with paper towels. Slather the fish with sauce (Nobu-style Saikyo Miso) and place in a nonreactive dish or bowl and cover tightly with plastic wrap. Leave to steep in the refrigerator for up to 2-3 days (I only left it on for 3 hours). Preheat the oven to 400 F degrees. 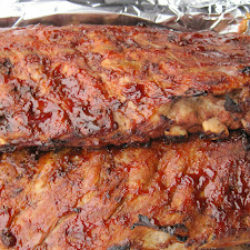 Preheat a grill or broiler. Lightly wipe off any excess miso clinging to the fillets but don't rinse it off. Place the fish on the grill, or in a broiler pan, and grill or broil until the surface of the fish turns brown. Then bake for 10 to 15 minutes. Arrange the black cod fillets on individual plates. Add a few extra drops of the Nobu-style Saikyo Miso to each plate. Nobu-style Saikyo Miso is what Nobu calls the combination of sake, mirin white miso paste and granulated sugar. This is a favorite of Robert De Niro's, (restaurant partner), who often eats it with sake' in hand. I’ve been to Nobu Matsuhito’s restaurant in Peru and completely agree with you: it is a superb culinary experience. He went to live in Peru when only 24 years old and there he got the inspiration and ingredients to start his Japanese- Peruvian Fusion kitchen, which became a world wide success! He is , without any doubt, one of the great chefs of our times. I didn’t know that about him. I purchased one of his books so I could be sure I made the recipe as he describes, properly. It was such a fun experience especially having the waiter select the dishes for us. I’m glad he did because I’m not sure we would have ordered all that he brought us. Looking through his book and reading some of his stories you can tell how passionate he is about cooking and using the freshest of ingredients. He now has his own little boutique hotel inside Caesar’s Palace in Las Vegas where we dined. The restaurant was packed. I’ve not had this dish, but I’ve seen the recipe to it several times – it looks wonderful! Sounds like you had a great experience. Las Vegas is a weird, but fun, place! I’ve seen Miso Salmon dishes, etc. but had never tried anything like this before. They served it on a platter for my husband and I to share with chopsticks. The piece they served us was thicker, more like sea bass but it was black cod. It was so moist that it just separated so easily in panels to lift off with our chopsticks and eat. So delicious! I knew I had to re-create it. I’m thrilled I was able to find the recipe. There are some online but they don’t go into detail like his book did. I hope you’ll try it. I was at the Asian market today, staring at all the many varieties of fish and was wondering why this particular cod was called black cod, when it was not even black. 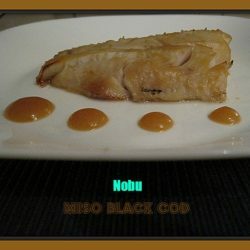 well when I came and googled for the difference, the first recipe that showed was Nobu’s black cod with miso. I can tell from your post how much liked this fish that you recreated it at home. I am also looking for some gluten free miso paste these days to make some Japanese food. Once I get I will try this recipe. Thank you so much for sharing. Hi Balvinder, I was actually looking today about Miso paste and you can purchase gluten free miso paste but not certain if the mirin or sake’ are gluten free. My neighbor can’t have any type of alcoholic beverage so I don’t want to label this gluten free since some are more sensitive than others. I know that recipe is online however, Nobu’s cookbook goes into greater detail how to prepare the recipe, leaving out the guess work. I hope you like this if you try it. 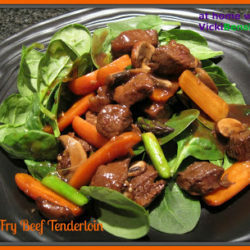 The sauce can also be used on beef and veggies. It’s so good. I had my first black cod in Seattle this fall, but haven’t looked for it locally. Maybe I’ll try this with salmon…I know Bill will eat that 🙂 How fun to have the waiter select your menu…sounds like he did an excellent job. I think this would be wonderful with Salmon and Sea Bass as well. It has a unique taste that I love and hopefully you and Bill will as well. It was definitely a fun experience that my husband and I both enjoyed. He’s not usually too adventurous so it was a departure from his typical dining experience. We had a great time. If you’re ever near one of Nobu’s restaurants you should try to stop in, just for the experience. Simplicity at its finest! Love black cod! I actually had never tried it before. It’s buttery and mild just like sea bass. It really was simple. I have leftover miso sauce that I will be able to use on other dishes as well. Love, love black cod. Its silky flesh is irresistible. I’d never tried it before but would agree. It was perfect, simple and delicious. It sounds like you had a wonderful time with your husband in Las Vegas, it is always nice to get way. This fish looks wonderful. Yes it’s always nice to escape for a few days with company you enjoy. Maybe you can try it at one of his restaurants then. I totally agree with you on Nobu, it is an experience and a beautiful one. So glad you took a break and got to spend some quality time with your hubby. Sometimes, we get caught in all the hoopla of things an forget to relax. Vegas is a place to relax and enjoy. Now, this cod looks pretty good and with miso, oh yumm. Yes we both needed a few days away. It was well worth it and a plus to enjoy the places around us. Both black cod and sea bass go well with miso and this is so easy to prepare and delicious. I think a lot of people love cooking with miso after this popular dish (but it’s been around for many years in Japan – but thanks to Nobu, it is now a very popular dish! ).